"Photo Credit - El Periodico"
After Guatemala’s civil war ended in 1996, a National Reconciliation Law (NRL) was enacted which granted amnesty for political crimes committed by both the Guatemalan Armed Forces and the Guatemalan National Revolutionary Union. The hasty establishment of the NRL was seen as a crucial component mandating that both sides lay down their arms, but it also threatened to institutionalize impunity in a nation seeking to rebuild itself after 36 years of civil war. In 1999, the Guatemalan Commission for Historical Clarification released a report titled Guatemala, Memory of Silence which stated that “Although many are aware that Guatemala's armed confrontation caused death and destruction, the gravity of the abuses suffered repeatedly by its people has yet to become part of the institutional consciousness… The massacres that eliminated entire Mayan villages… are neither perfidious allegations nor figments of the imagination, but an authentic chapter in Guatemala's history.” The report found that about 200,000 people—the vast majority of them civilians—were killed or “disappeared” during the war, a number that was much higher than initially thought. Rios Montt’s brief presidency (1982-83) was arguably the most violent period in the civil war, in which thousands of unarmed indigenous civilians were killed. Despite the initial feelings of helplessness after the passing of the NRL, a law which was looked at as being drafted by and for the military and guerillas, it excluded crimes against humanity which were not subject to any statutes of limitation under international law. 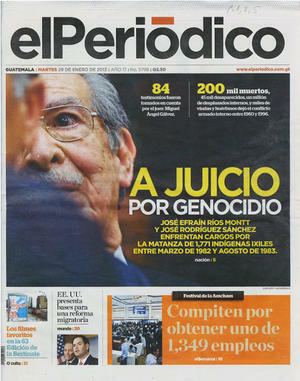 Legal motions in Spain staleed progress in the case for several years until 2005, when the Spanish Court ruled to the surprise of many that they would in fact act upon the principles of universal jurisdiction and charge Rios Montt and other senior officials with genocide, terrorism, torture, and illegal detention. The Spanish Court soon after issued arrest warrants in July 2006. Similar to Duvalier in Haiti, Rios Montt remained connected to the traditional political and economic centers of power in the country—and as such successfully ran for a seat in Congress in 2007, granting him immunity from prosecution until January 14, 2012. Despite this roadblock—it was a perhaps even blessing in disguise—the organizing by the victims and human rights defenders continued unabated in the face of threats and intimidation. This grassroots effort to prosecute high ranking military officials finally bore fruit in 2011, when General Héctor Mario López Fuentes, the former Minister of Defence was detained for his alleged role in massacres committed in 1982 to 1983. Once Rios Montt was no longer covered by Congressional immunity in January 2012, he was indicted in a Guatemalan court for committing crimes against humanity. On March 1, 2012, according to the established norms of international law, a Guatemalan judge refused to grant Rios Montt amnesty from the charges of crimes against humanity—leading to the first time that a former head of state would be tried for genocide in their own country. On January 31, 2013, the criminal trial of Rios Montt for crimes against humanity formally began. Although it is true that the charges against Duvalier are not on the level of genocide—and thus are not comparable in that regard—the Inter American Commission on Human Rights has classified the systematic abuses carried out by Duvalier as crimes against humanity. Through the command of the Ton Ton Macoutes and the Haitian army, Human Rights Watch has reported that Duvalier oversaw the killing and torture of thousands, while hundreds of thousands more fled into exile. While different in many ways, like Haiti, Guatemala also suffers from a lingering history of deep-rooted racism, significant structural inequality, foreign intervention, deep politicization with limited political participation by the popular classes, and a history of a corrupt judicial system. Despite this, the success of Guatemala in bringing Rios Montt to trial for crimes against humanity highlights that, despite the overwhelming odds at times, justice can prevail.